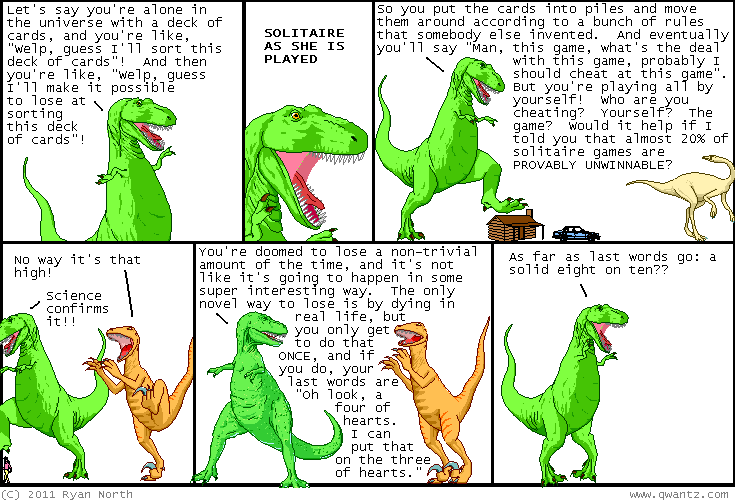 Dinosaur Comics - April 21st, 2011 - awesome fun times! April 21st, 2011: If you scroll down to "Big Ups And Shouts Out", you will see tons of comics that I love. Check them out: they're great! Maybe you should read... ALL the comics? One year ago today: this comic was inspired by a dude joey and i saw yesterday. he was walking his cat. he'd walk a bit, the cat behind him would catch up, and then they'd walk some more. i didn't know you could walk a cat, but this dude PROVED US WRONG.